We live and play in northern Minnesota — a fabulous landscape filled with wild rivers, deep woods, diverse wildlife, and the greatest Lake. An abundance of great trails, campgrounds, state parks, outfitters, and lodging makes this landscape accessible to nearly everyone. Still, many visitors (and natives) stay only on the beaten path. There is so much more to discover! For every Gooseberry Falls State Park with its stream of gawking tourists, there are three beautiful unnamed waterfalls you can have all to yourself. For every Wi-Fi coffeehouse where you can sample “Moose Mocha” or “Sawtooth Sunrise,” there are ten incredible rocky overlooks where you can sit and experience the real thing. And for every crowded campsite where you listen to your neighbor’s radio until midnight, there’s another campsite in the quiet woods on a quiet lake where all you hear are loons. Our logo comes from a famous pictograph panel at Hegman Lake north of Ely, Minnesota, just inside the Boundary Waters Canoe Area Wilderness. 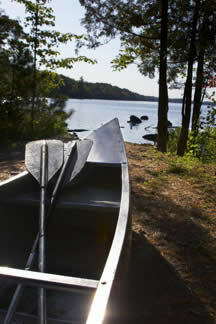 With good directions and basic paddling skills, the average family could make a great day trip in to see them. And doesn’t that guy look like he’s embracing life and having fun? We hope you, too, can look up in awe at this pictograph panel from a canoe just like our family has. Guiding people to discover beautiful wild places — that’s why we created There and Back Books. Andrew’s parents first set eyes on each other on the North Shore, and his life has centered here since birth — despite growing up in the Twin Cities. As a kid, he caught netfuls of smelt at the Cross River, jumped cliffs into the deep pools of an unnamed North Shore river, helped to band woodcock in the open field of North Shore homesteads, and shut his eyes tight each time the family wagon drove around Silver Cliff (note to today’s drivers: don’t worry, there’s a tunnel through the cliff now and his eyes stay open). With his intrepid father, he had to abandon a mid-1970s assault on Carlton Peak due to lack of recognizable trails. As a canoe guide and outdoor educator in Ely, he learned that “sauna” is a three-syllable word (sow-ooh-nah). In his twenties, he bushwacked by snowshoe much of what is now the Manitou-Caribou section of the Superior Hiking Trail. At age 28, in his “before kids” era, he was the editor and lead author of the first Guide to the Superior Hiking Trail. Andrew has worked for environmental education and preservation organizations in Duluth and on the North Shore since 1992, including Great Lakes Aquarium, Sugarloaf Cove and Minnesota Environmental Parnership. There and Back Books is not Sally’s first experience with starting up a publishing business. She was one of a few employees in the early days at Pfeifer-Hamilton Publishers, the premiere regional publisher of Northeast Minnesota in the 1980s and 1990s, and helped produce and market such early books as Sam Cook’s Up North and Quiet Magic. Soon she was inspired to go back to college a second time and finish a degree in graphic design. While at the University of Minnesota Duluth, her first graphic design job was with the Outdoor Program. Between leading freshman orientation canoe trips and backpacking trips in the Grand Canyon, she created fliers and ads for everything from maple syrup programs to climbing trips at Palisade Head. When a ski trip to the Rockies with a handsome new student naturalist named Andrew (Slade) fell through, she took off with friends on a 10-day winter north-to-south traverse of the Quetico and Boundary Waters. She is a graduate of UMD, in communications and art. Sally has her design studio in Duluth's downtown, where the Lake Superior beach is a constant distraction out her 11th floor windows. Andrew and Sally, partners in publishing and in real life, started There and Back Books in 2007. One of their first dates, in 1990, was a 10-day canoe trip through the Quetico canoe country, where they livened up long, hot lake crossings by dreaming up books they could write and produce. Though they’ve lived in Montana, Germany and Ely, Minnesota, they keep coming back to the North Shore and haven’t lived anywhere except Duluth for a very long time now.